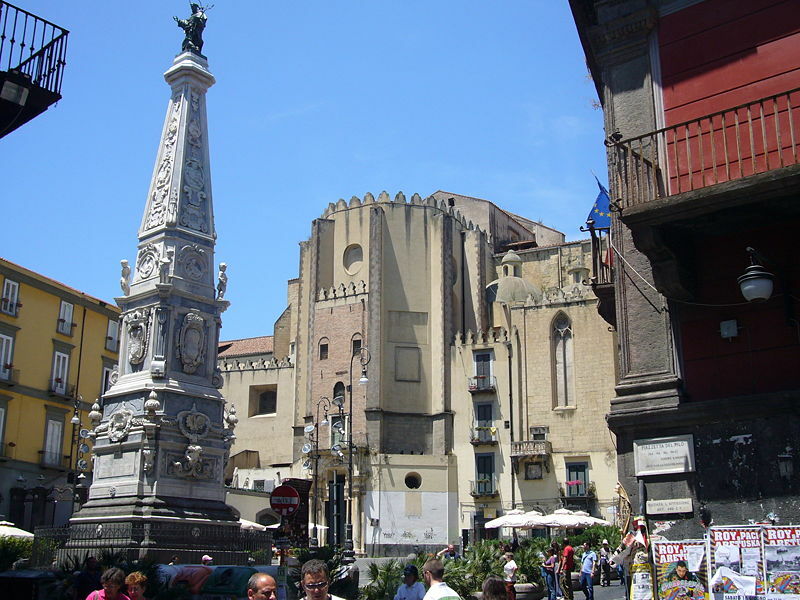 The Highlights of Naples in its historical centre. The Piazza of the Gesù Nuovo is the entrance gate to the old centre. 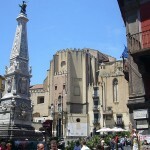 The Spire of the Immacolata (Vergin Mary) and the Church of the Gesù Nuovo introduce the Baroque atmosphere of the area. Not far away is the gothic Church of S. Chiara, built in 1310 by Robert of Anjou and turned into a baroque church in the 1700’s. After being damaged by the bombings of 1943, it was restored back to its original form. A stroll in the cloister of the Clares is not to be missed. It is decorated by splendid ceramic tiles of the 1700’s. 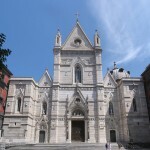 Walking along the “Spaccanapoli” (split Naples) you’ll approach the S. Domenico Square with its church. Not far away we find the extraordinary Sansevero Chapel. A visit to this spectacular baroque complex is not to miss. Via Tribunali is the parallel one of the so-called Spaccanapoli street; it itersects Via S. Gregorio Armeno, one of the most important italian centres for the production of Christmas Cribs. At the end of this street we found ourselves in the heart of the greek-roman town, where the layers can still be seen. 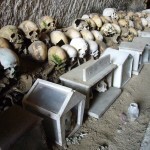 You can experience a” leap back to the past” by partecipating to an optional two hour trip through subterranean passages and cisterns ending with the visit of the greek-roman theatre, or by approaching the hidden area under the Church of S. Lorenzo, where to enjoy part of the original commercial centre dating back to the roman time. 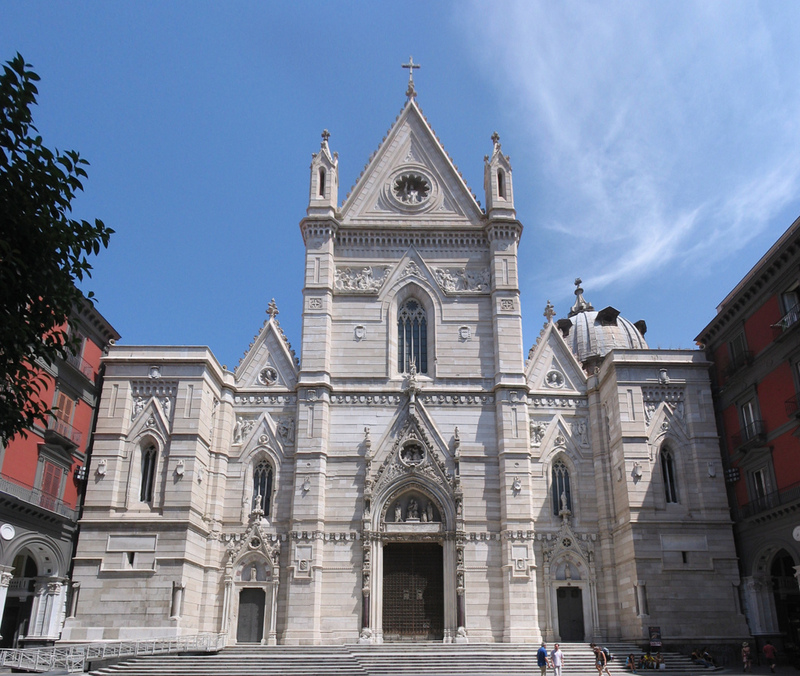 Via Duomo will complete the tour of the historical centre. The road takes the name from the Cathedral, a gothic structure completed by Robert of Anjou in 1313. 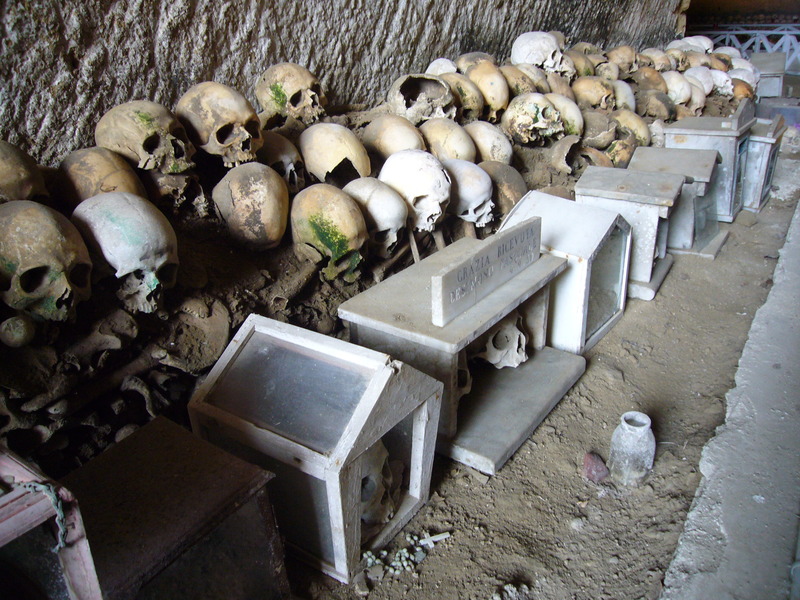 Inside we’ll admire the Chapel of the treasure of S. Gennaro,where the flasks with the blood of the saint are kept all the year long and exhibited during the miracle of the liquifaction of the blood itself.